Stay informed and educated about CVJC events! Learn how you can TakeAction with us! Our current Top 5 Volunteer needs! Check out these 10 Tips To Shopping Justly. Host an Awareness Event: Chocolate Party! Thousands of child slaves on the West Coast of Africa work on Cocoa plantations in order to provide us with cheap chocolate. Help stop the demand of slavery through Fair Trade Chocolate purchases by having friends over to sample Fair Trade Chocolate and share where to buy products that do not contribute to this form of slavery. Here we’ve provided a fully comprehensible guide to hosting your own Chocolate party. Host an Awareness Event: Movie Night! *Disclaimer: All thoughts and ideas that come through these movies are not necessarily endorsed or affiliated with CVJC in any way. Some of the content in these videos may not be suitable for all ages. Viewer discretion advised. Plot Summary: “Modern slavery.” It sounds like a paradox. Hasn’t humanity progressed? Didn’t we leave slavery dead on the battlefields of the American Civil War? Didn’t social reformers like Lincoln and Wilberforce legislate against such cruelty over a hundred years ago? So we had thought. But, with over 27 million enslaved people in the world, human trafficking is once again the battlefront of the century. Click here to read more, watch the documentary, or support Exodus Cry and purchase the documentary.. Plot Summary: Amidst the apparent growing prosperity of India, there is a dark underbelly of poverty of another side of the nation that is little known. This film is a chronicle of filmmakers Zana Briski and Ross Kauffman’s efforts to show that world of Calcutta’s red light district. To do that, they inspired a special group of children of the prostitutes of the area to photograph the most reluctant subjects of it. As the kids excel in their new found art, the filmmakers struggle to help them have a chance for a better life away from the miserable poverty that threatens to crush their dreams. Read more about this documentary, or buy the movie and support these talented artists here.. Plot Summary: Fair Trade Pictures to support human rights activism against human trafficking and slavery on a community level. If you would like to find out more about Made In a Free Worlds projects you can follow the link here.. But if you would specifically like to buy a copy of Call + Response and support Made In a Free Worlds and their efforts to battle human trafficking you can purchase the kit here.. Plot Summary: Is the chocolate we eat produced with the use of child labour and trafficked children? The award winning Danish journalist Miki Mistrati decides to investigate the rumors. His hunt for answers brings him to Mali in West Africa, where hidden footage reveals illegal trafficking of small children to the cocoa fields in neighboring Ivory Coast. Kids as young as seven years old work illegal in the plantations where they face a dangerous job cutting down the cocoa and carrying heavy loads. Some are victims of trafficking and most of the kids are never paid. Find out more about this documentary by clicking here.. Plot Summary: Multinational coffee companies now rule our shopping malls and supermarkets and dominate the industry worth over $80 billion, making coffee the most valuable trading commodity in the world after oil. Plot Summary: One of them wanted to earn money so she could treat her parents like a king and queen. Two of them were enticed by the promise of a good education. Another one wanted to buy medicine for his sick son. None of them ever dreamed they would become slaves in the United States. But that is what happened. Make a difference in someones life. Show up. Prevent trafficking. Stop the cycle. Be the change. 1. 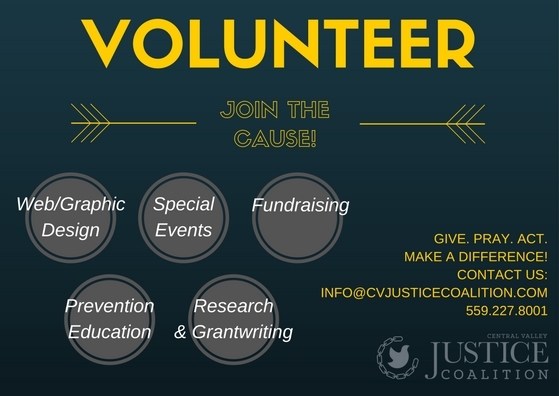 Volunteer your time with CVJC! 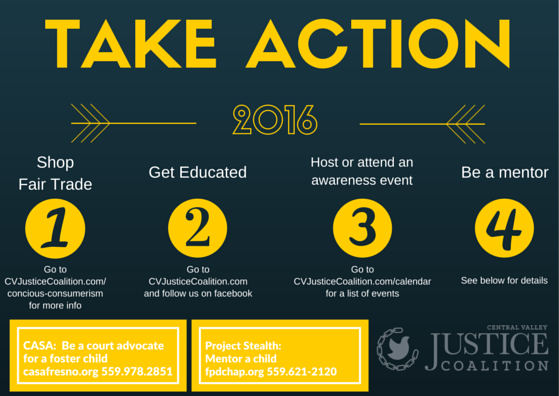 View our Volunteer needs positions and contact us at info@cvjusticecoalition.com to learn more. 2. Participate in Mercy Street, a monthly street outreach led by MadeForThem and Beauty for Ashes, Int’l. Training is required, email info@madeforthem.org for more info. 3. Mentor or volunteer with our partner organizations such as Breaking the Chains or MadeForThem all working with individuals who have been trafficked or are at high risk of being trafficked.